Many Women Leave Engineering, Blame The Work Culture : All Tech Considered From the aerospace sector to Silicon Valley, engineering has a retention problem: Close to 40 percent of women with engineering degrees either leave the profession or never enter the field. Respondents in a survey of women with engineering degrees said that many companies did not provide opportunities for women like them to advance and develop. From the aerospace sector to Silicon Valley, engineering has a retention problem: Close to 40 percent of women with engineering degrees either leave the profession or never enter the field. Conventional wisdom says that women in engineering face obstacles such as the glass ceiling, a lack of self-confidence and a lack of mentors. But psychologists who delved deeper into the issue with a new study found that the biggest pushbacks female engineers receive come from the environments they work in. The findings were announced recently at the annual American Psychological Association convention in Washington, D.C.
Over the course of three years, Nadya Fouad, a psychologist at the University of Wisconsin, Milwaukee, surveyed 5,300 women who earned engineering degrees within the past six decades in order to figure out why so few stayed in engineering. Fouad reported that only 62 percent of respondents were currently working in engineering. Those who left the field provided their reasons for doing so in the survey. "It's the climate, stupid!" she said during her presentation, referring to the "old-boys club" workplaces that she says still exist in many engineering organizations. Respondents in her study reflected her sentiments, with many calling the engineering workplace unfriendly and even hostile to women. They also said they felt that many of these companies did not provide opportunities for women like them to advance and develop. 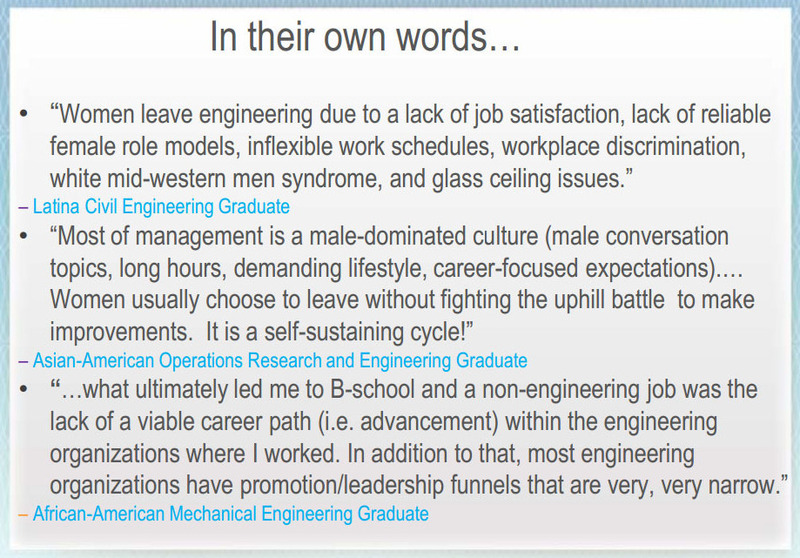 "Women's departure from engineering is not just an issue of 'leaning in,' " said Fouad, lead researcher of the study. "It's about changing the work environment." Often when women are frustrated with the office climate and choose to leave their jobs, they also end up leaving the engineering industry entirely, Fouad said. For the past two decades, 20 percent of engineering graduates have been women, yet only 11 percent of practicing engineers are women, Fouad said. 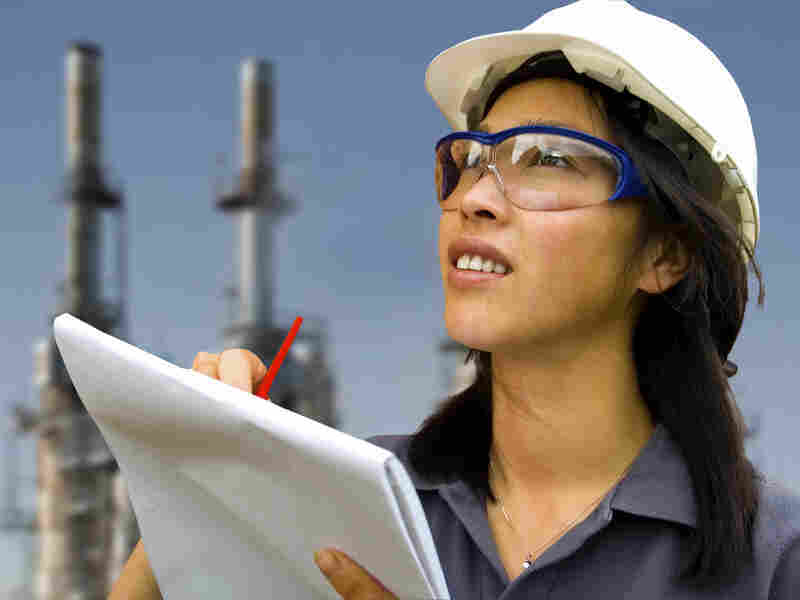 Compared with other skilled professions such as accounting, medicine and law, engineering has the highest turnover of women. Fouad also found that support for women did not differ between engineering disciplines. Women faced the same issues in the fields of aerospace, biotech and computer software. The findings may provide additional insight into why so few women work as computer engineers in Silicon Valley. A sampling of responses from a survey of women who earned engineering degrees, compiled by Nadya Fouad, a psychologist at the University of Wisconsin, Milwaukee. The study found that only 17 percent of women left engineering because of caregiving reasons, which Fouad said dispels the notion that pregnancy plays a big part in keeping women out. But she does point out that many of those who did leave to stay home with children did so because their companies did not offer flexible enough work-life policies. Fouad also said lack of confidence was not a factor as to why women left engineering — her study found no difference in confidence levels between those who left or stayed in the field. Although there are many programs in place at undergraduate universities to feed the engineering pipeline, she said that when those women graduate and enter the work force, that's when they face the problems that ultimately cause them to exit engineering. "It's not women who need to change — it's the work environment that does," she said. Fouad offered some recommendations for engineering companies looking to retain female employees. She says the organizations first need to recognize the problem, and then commit to change at the leadership level. That way change can perpetuate throughout the system. But not everyone agrees with Fouad's findings. 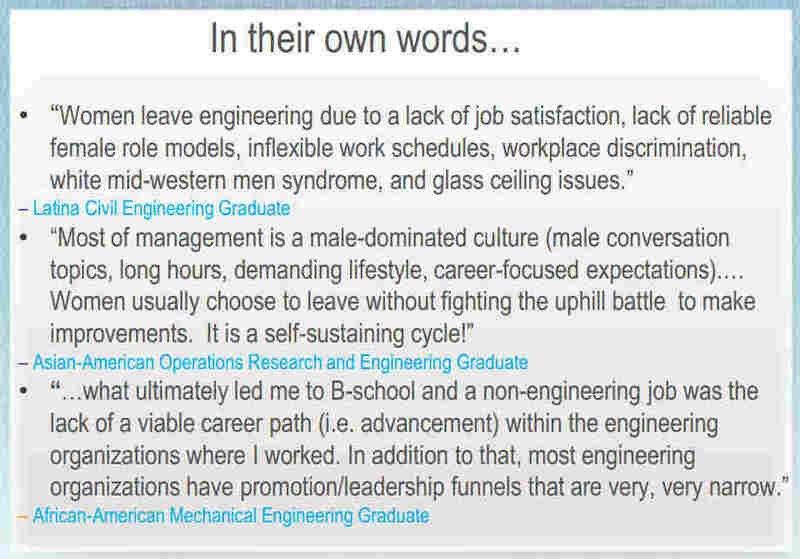 "Women aren't leaving engineering to go and hide in a corner. They are leaving for many reasons which a study like this may not find," said Elizabeth Bierman, president of the Society of Women Engineers and an aerospace engineer for 20 years. "The work environment may be one reason, but for the majority it is not the case." Her organization recently conducted its own retention study and found that although women do leave the engineering workplace faster than men, they do so for a variety of reasons. Many of those reasons, such as lack of work-life balance, also resonate with men, Bierman said. The bigger problem facing women and engineering, she said, is getting more women into the engineering pipeline. Bierman says companies looking to retain both women and men should improve their work-life balance policies. "We've found that women stay in engineering because they want to make sure they are making a difference," she says. "If women feel they are making that difference, retention levels will be higher."